Cioppino is a hidden gem that doesn't get talked about as much as it should. Great chicken al mattone. But getting there can be a hassle. That's not a daiquiri. He would be laughed off El Floridita with that recipe. that chef should have kept his mouth shut until the article came out. anon - why? It's not like Mariani's "cover is blown" - he announces his presence to every restaurant he's visiting in advance. And - regardless of your thoughts on Mariani's methods - I can understand why any chef would be excited about having been paid a visit and being in contention for the list (and even subtly bragging a bit). true enough, Frod, but what if Mariani really didn't like what he had and then leaves him off the list?! I am superstitious like that! Since Mariani is self-professedly not a restaurant critic, he doesn't say bad things about places that disappoint, just identifies those that are his favorites in any year. Given his M.O. of picking a few places to visit in each city he goes to, and typically only naming one (at most) from any particular city, there is no particular shame in not being named, and likely some good spin just in being a "nominee." Mr. Mariani was incredibly gracious during his visit to Miami. It seems that most of the negative hype is fabricated as he was a lovely dinner guest. 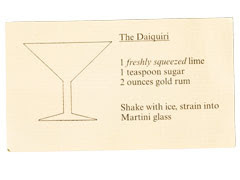 And by the way – his daiquiri recipe is simple and delicious. I don't think the source of the recent Chicago comments had any reason to fabricate, but I'm glad to hear you had a good experience (some other chefs in Chicago chimed in to say good things as well). In case anyone is interested, Carmen tried to open in St. Michel and the Landlord and her simply did not get along. Seems she packed up and went to NYC with a financial backer, though I have not heard anything about her since. Sometimes its fun to cook for a "celebrity", especially for a gracious one! I think Frod's point is that in a way, (I don't know Mariani and am not implying he is THAT full of himself), but if you get to cook for him, you've already won. "your restaurant has become this well regarded"